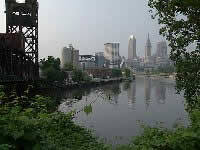 For centuries, the Cuyahoga River has been on the frontier. When the United States was a new nation, the river literally marked the western frontier. But "civilization" came to the river; by 1870 the river was on the industrial frontier. On the river's banks sprouted a multitude of factories, a booming display of what was called progress. The river, as it flowed through Cleveland, became a foul-smelling channel of sludge, with an oily surface that ignited with such regularity that river fires were treated as commonplace events by the local press. But then, in 1969, the river burned again, just as a third kind of frontier swept across the nation: an environmental frontier. And the Cuyahoga River became a landmark on this frontier too -- a poster child for those trying to undo the destruction wrought by progress in America. The Return of the Cuyahoga is a one-hour documentary about the death and rebirth of one of America's most emblematic waterways. In its history we see the end of the American frontier, the growth of industry, the scourge of pollution and the advent of a political movement that sought to end pollution. The Cuyahoga's story is a particularly apt example for future environmental efforts, because the once burning river can't just be cleaned up and "set aside" as a pristine wilderness park - it runs right through Cleveland, and like most American rivers, the Cuyahoga has to serve widely varying needs - aesthetic and economic, practical and natural, human and animal. The challenge: how to maintain industrial uses of the river near Lake Erie, encourage recreation and entertainment, and yet preserve the nature in and around the river. It's the same challenge that much of our riparian nation is facing today. Other films by Larry Hott and Diane Garey are John James Audubon: Drawn by Nature, The Harriman Alaska Expedition Retraced and The Boyhood of John Muir. "For years the Cuyahoga River symbolized all that was wrong with the nation's environment. It was polluted, toxic, and even combustible. With his superb eye Larry Hott has captured the story of its decline and near death, its rejuvenation and restoration. His documentary reminds us that rivers flow not just across the American landscape but through the heart of American culture and spirit." "Like the crooked river itself, this documentary is a sprawling story that shows how the Cuyahoga has influenced and has been affected by issues as diverse as industry, race, urbanization, history, and most recently, the need of people to reconnect with their natural environment...The diversity of solutions being implemented on the Cuyahoga are fascinating and creative. I have my fingers crossed for their successful implementation and future development...This documentary should be required viewing for those who feel unable to improve their environment. Citizens cleaned up the Cuyahoga, and citizens have the power to make even more profound environmental improvements happen." "[The film] relates the Cuyahoga to other rivers in urban areas and indicates that this could be the story of many regions of the country...Successfully weaves together environmental science, history, economics, politics, and social sciences. It could be shown in a variety of high school courses. I think there is a healthy balance between the honest depiction of the environmental wrongs that were done to the river with the uplifting examples of progress and improvements that have been made there." "The Return of the Cuyahoga is more than a history of the desecration and restoration of the Cuyahoga River. It is a graphic story of depth and emotion about people who are committed to restoring life to a valued natural resource." "Much has been said of western water wars and the legacy of abuse of our lakes and rivers, so I wasn't expecting to learn anything new by watching The Return of the Cuyahoga. I was mistaken. This comprehensive, well-produced documentary examines the life, death, and restoration of an urban river within a context of changing social norms with respect to how people relate to the environment...This documentary will be very interesting to those examining the often-difficult path to sustainable development, as well as those concerned about the complexities of urban river ecology and management. Its interdisciplinary approach opens many avenues for discussing the environmental, ecological, social, and political aspects of water resources making it an ideal teaching tool for many different courses." "The Return of the Cuyahoga is ultimately an uplifting story of hope, that it is in fact possible for large populations of humans to coexist with natural waterways. An excellent addition to public and school library environmental collections." "This video is recommended in support of high school and college curricula in American studies, environmental studies, and urban studies. Educators will find the Teachers Guide to be an excellent resource for asking probing questions and suggesting interesting projects related to environmental conservation and environmental activism." "Rivers become ideal metaphors for where we have been and where we are going. This symbolic power is put to marvelous use in The Return of the Cuyahoga...What emerges from [the film] is a local story of vital national importance." An illustration of the water cycle in a cautionary tale about pollution.